Our range of products include herclon injection, paracetamol injection and trastuzumab injection. Medicare Remedies popularity in the pharmaceutical industry can profoundly be attributed the range of Herclon 440 mg from our exclusive assortment of medicines. The offered range is sourced from the authentic vendors. Moreover, our qualified pharmacists test the entire range firstly, at the time of procurement from vendors' end and secondly, at the time of delivery from our end. Medicare Remedies is instrumental in offering optimum quality Herclon injection to our valuable customers. Herclon injections are commonly used for the effective treatment of late-stage HER2-positive breast cancer. Driven by an intense desire to attain maximum customer satisfaction, our team of logistics professionals assures timely delivery of these injections at the customers’ end. On the demand of our esteemed clients, we are actively devoted towards providing a supreme quality Herclon Trastuzumab 440mg Injection. 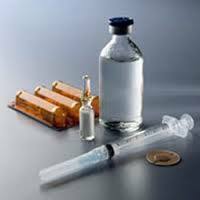 This injection is provided in a safe packaging material and is commonly used for in the treatment of cancer. By using premium quality chemical compounds and the latest technology, our vendors' process this injection under the utmost hygienic environment in accordance with industry set standards. Moreover, we provide this injection to our clients at most reasonable rates. we are the Leading Supplier and Distributor of Paracetamol Injection, we are offering the pharma franchise opportunity and Pcd pharma Franchise for our wide range of pharmaceutical products all over India. We hold expertise in offering optimum quality Trastuzumab Injection to our valuable customers. These injections are commonly used to treat HER2 breast cancer. The team of quality controllers keeps a strict supervision of entire manufacturing processes to ensure that these processes are carried in compliance with FDA set standards. 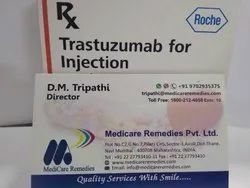 Looking for Trastuzumab Injection ?